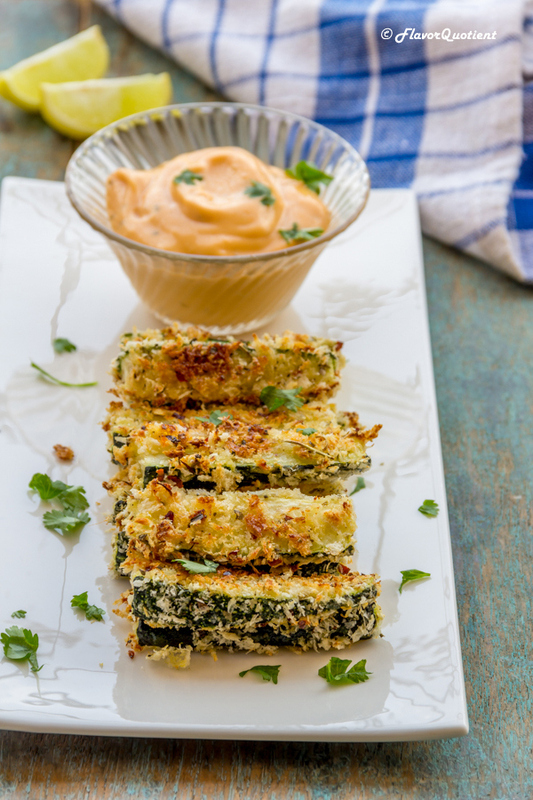 Quick and easy baked zucchini Parmesan is the ultimate munch-on food to enjoy with friends & family to enjoy a relaxing time without worrying much of a complicated recipe! Zucchini is not a very popular vegetable in Indian households but I strongly believe it should be. I do not remember my mom making zucchini in my childhood. But I love this green goodness and I really wish it gets a permanent position in all Indian kitchens. 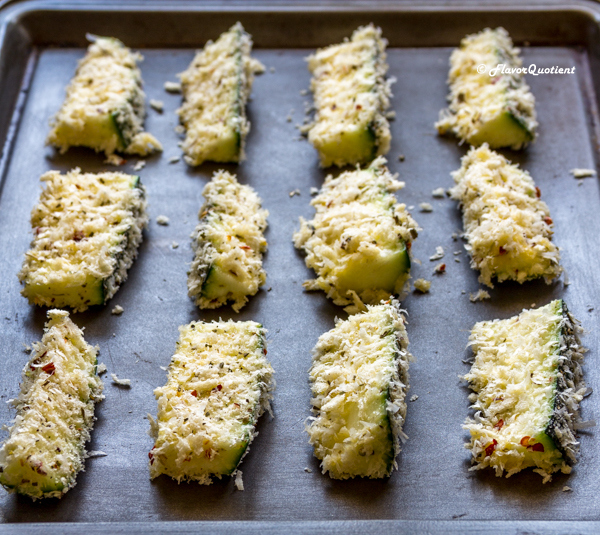 With that hope, I am bringing this super easy and super quick Parmesan baked zucchini recipe today. This is such a fun recipe that you will love to make it with whole family. Cut the zucchini, mix them with few things and shut them in the oven for just few minutes and BAM! You are done! Can things get easier than this? This recipe was on my to-do list for a long time but finally the right time arrived for this to materialize. Baking is my favorite form of cooking these days and I look for every possibility of using this technique. I am recently avoiding the baked pastas even though I love them from the core of my heart. Recipes like these have become my best friend now and I loved the way it turned out. 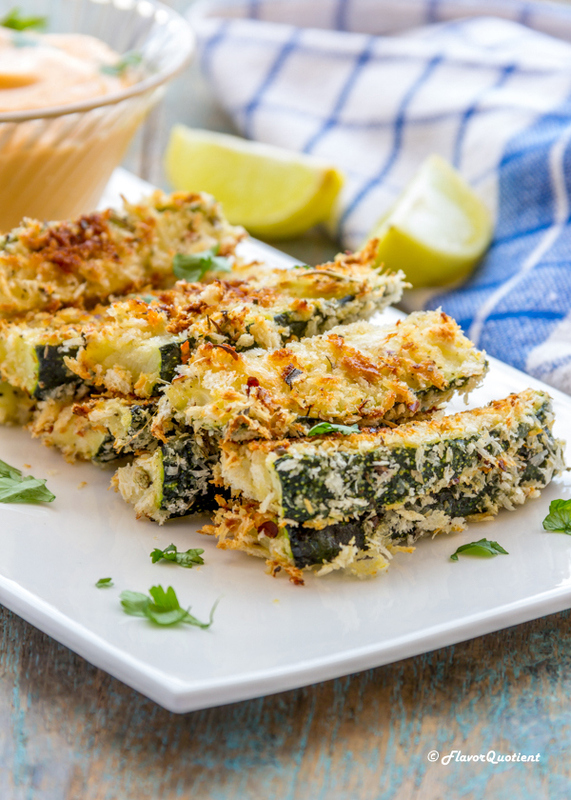 The crispy Parmesan-Panko coating over the soft zucchini is a match made in heaven. After the Parmesan baked potatoes these are my second choice for a quick bite which can be an ideal leisure food on a lazy evening. Just grab your favorite thriller and settle yourself in the couch with a plate full of these goodies and you are sorted for a wonderful quality time with yourself! My love for good food has made me discover uncountable delicious recipes and I can’t be more thankful for that. Being brought up on traditional Indian food, my body and soul do crave for Indian food, but my explorer foodie mind is always on the lookout for something new and exciting. This Parmesan baked zucchini is a real example for the same. This is a very common recipe over the internet and you will see different versions of this, some with egg and some without. I like using egg as I feel it adds an extra edge to any food. You can use only the egg white for the breading purpose in this recipe. Whichever way you make it, this is gonna emerge as a winner as there is no way this recipe would fail to impress you or your friends & family! Preheat oven to 220 C / 425 F and place the wire racks at lower rack. Lightly coat 2 baking sheets with cooking spray or oil. Half the zucchini crosswise and then cut into ½ inch wedges. In a large shallow dish, mix together panko, Parmesan, Italian seasoning, paprika, ¾ teaspoon of salt and ¼ teaspoon of pepper. 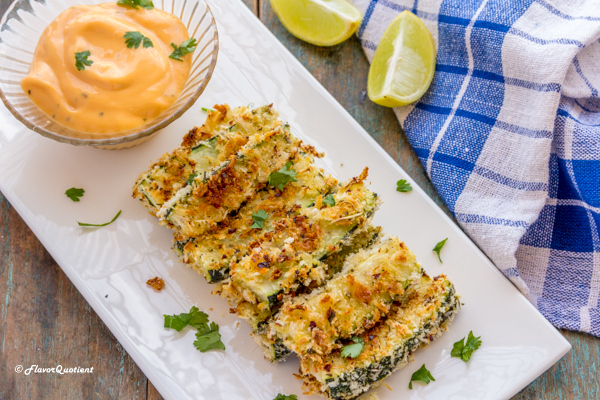 Take one zucchini wedge at a time and dip it first in egg, then place on breadcrumb mixture and press to coat all over. 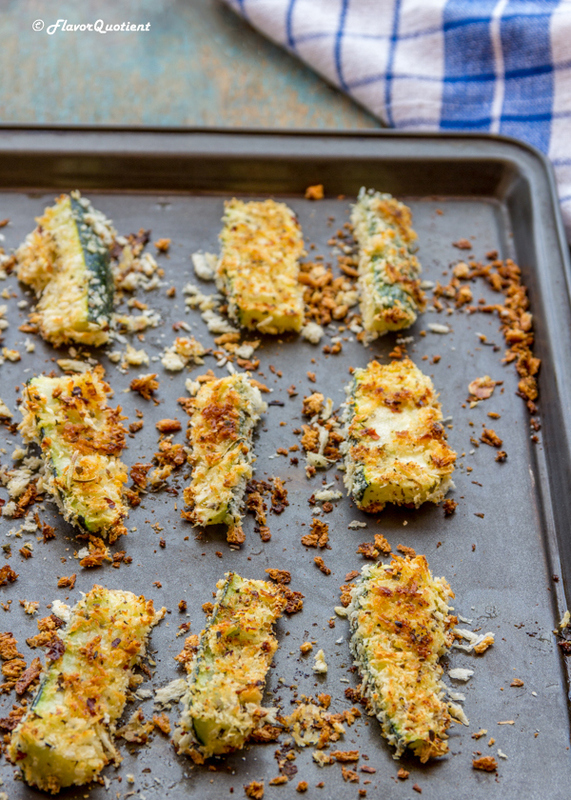 Arrange the breaded zucchini wedges on the prepared baking sheets in a single layer. Bake them until the coating is golden brown and crisp for about 20 minutes for each baking sheet. Season to taste with salt and pepper; serve immediately. Uh, genius, These look so darn tasty and are the perfect sub for fries alongside a burger! Perfect for a BBQ appetizer, too. Cannot wait to try!